150Gr of Salmon filet (sushi grade). 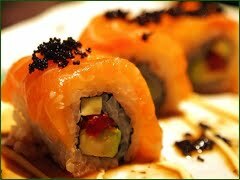 Sorry guys, but this recipe is for inside out sushi roll only. So if you have yet to purchase the skills needed to make an inside out roll, please roll out to the manual. Roll the nori as you normally would have done, with the avocado and cucumber inside. Don’t mind the fact the it’s not rich filled on the inside – because when your finished, the outside of the roll is going to make the most impression. Topping time – Just before you cut the endings of the roll, slice your salmon filet into half an inch thik, 2.5 inch long layers, and lay them tight next to each other on top of your roll until the entire top of your roll is covered with salmon. Use your rolling matt to tight the salmon firmly to the top of your roll, and cut. Best served with Soy and/or Tariaki souce. I love this site. I’ve learnt a number of things here, what one could pay to learn out there. You guys are doing a great job here. Thanks.